Developer Mum not Proud’s Baikoh is one crazy word game! I mean who would have thought that combining Tetris with Scrabble could provide such an irresistible and addicting gameplay experience. Plus there are several deadly traps that make this fast-paced game more challenging. Well, the app’s skull icon certainly warns players that this game isn’t one of those casual word games. It’s tough to play and requires players to react quickly as tiles keep falling down, at a much faster rate when the game progresses. 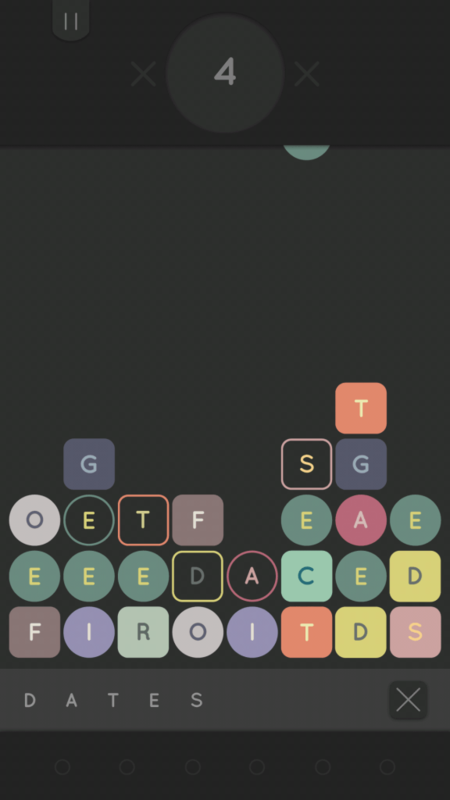 When the game starts, the player has to tap letter tiles to form words. As he types letters, new tiles fall from above. He has to make sure that falling tiles don’t stack up and reach the ceiling. If a column hits the top of the board, it’s game over. To avoid this, he has to keep forming words and swiping the screen to get rid of tiles. The player can take the help of badges to avoid an early end, but let me tell you, it’s not easy. This game is not easy to play. Well, if you have just started playing Baikoh, then you might find these tips, hints and tricks useful. You will also learn about various badges and find out how to unlock and use them. Baikoh is a fast-paced game and so you shouldn’t be wasting your time hunting for big words. Your goal is to clear as many lines of letters as possible so that tiles don’t pile up on top of each other and hit the danger zone. Your priority should be to spell two-letter or three-letter words to avoid that dreaded “game over” screen. Two-letter words will play a crucial role in later stages of the game, when tiles drop at a faster rate. You can, however, spell 4-letter or 5-letter words occasionally, when there are just few lines on the game field. But finding shorter words is a must if you want to stay in the game and score more points. Focus on clearing lines on the bottom-most part of the game field. Try to make words using tiles on the bottom of the game field so that the stack does not get taller. When tiles fall faster, you might change your strategy and start typing words using tiles on top of a column, just to lower its height. You can start spelling words using tiles on the upper and lower part of taller stacks to avoid hitting the ceiling. You can send the same word several times in solo or versus mode if you fail to form new words. 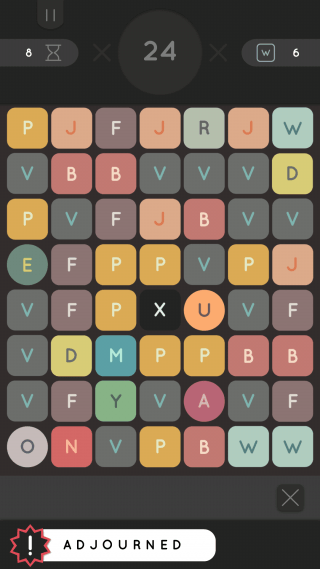 Since random tiles are dropped in the board, you may notice several duplicate tiles. Make the most of these duplicate tiles to repeat the same word several times. Badges are nothing but power-ups. You can use them when you can’t find words or when you just can’t stop letter tiles from stacking and reaching the top. You can unlock these amazing badges by completing simple in-game tasks. Once a badge is unlocked, you can equip it, but make sure you have empty slots to add a badge. You will need to free up slots using Baikoins. 1. Wild card (M): Can become any letter you want. This badge should be used when you can form a big word but that one letter is missing. 2. Double Coin (A): To unlock it, you will need to form an 8-letter word and swipe the screen to send it. You can use wild card to quickly spell an 8-letter word. When this badge is equipped, you will get bonus points for forming words. The longer the word you make, the longer the bonus. If you want to score more points and baikoins, then you must equip this badge. 3. Tank (M): When activated, this badge places a projectile on top of the screen. It fires a cannonball, clearing anything in its path. Can be very useful to clear stacks of tiles that look dangerous and may hit the ceiling anytime. 4. Chomp (M): Send 200 words to unlock this badge. This is another great power-up, which can be used to clear taller columns. This cute beast will gobble the tallest stack of tiles when you activate it. 5. First Aid Kit (M): You must demolish at least twenty traps to unlock this badge. You don’t have to destroy traps in the same game, just make sure you keep destroying them in every new game to reach the “20” target. This badge clears all traps, including those that were affected by them. 6. Box Cutter (A): You will have to score 400 points in a single game to unlock this power-up. To get more points, you can use Double Coin power-up. With this passive badge activated right in the beginning, you will notice that it randomly slashes tiles on the game board. 7. Double Double (A): Type a single word to score 50 points in a game if you want to unlock this power-up. You can use the wild card badge to create a longer word and score points. This badge is somewhat like the “Double Coin” power-up. You will get more points when you send words. 8. Bouncing Ball (M): To get this power-up, you must use the “Tank” badge to blast away a total of 100 tiles. Bouncing Ball is an upgrade of cannonball, so when the projectile shoots the ball, it will bounce once before destroying tiles. You can bounce a ball off walls on the left and right side of the screen to destroy more tiles. 9. Good Boy (M): Use the “Chomp” power-up to destroy 100 tiles over several games if you want this badge. It acts as a supplementary to Chomp. When activated, Chomp power-up will stay for some more time. 10. Healing Shield (M): Use the First Aid Kit to heal 32 tiles that have been affected by traps. You must do this in a single game to unlock it. The Healing shield is upgraded version of the First Aid kit badge as it neutralizes traps and clears any effects on normal tiles. 11. Fat Burner (A): You must score at least 800 points over several solo games to unlock this badge. Since it’s an automatic r passive power-up it will ignite an entire row clearing it. You must send words as fast as you can to keep it lit. It will disappear if you send wrong words. 12. Pinball (M): You will have to use the tank or bouncing ball power-up to destroy vowels – A, E, I, O or U. When you activate it, it will make two flippers (like the ones you see in a pinball machine) appear on the left and right side of the screen. Now when you use a tank, the cannonball would bounce off one these flippers and may destroy some more tiles. 13. Life Saver (A): You will have to win 10 versus matches to unlock this badge. It gives you a second chance when the game ends. You will still have a few seconds to destroy tiles when the game’s over. 14. Punch Glove (M): Very useful in versus mode. You can unlock it once you send 30 traps in over several versus matches. You must activate it to knock off any letter tile. Connect to the game’s Facebook and Twitter pages and submit your ideas to get 100 coins each. Just tap the “feedback” button on the home page. 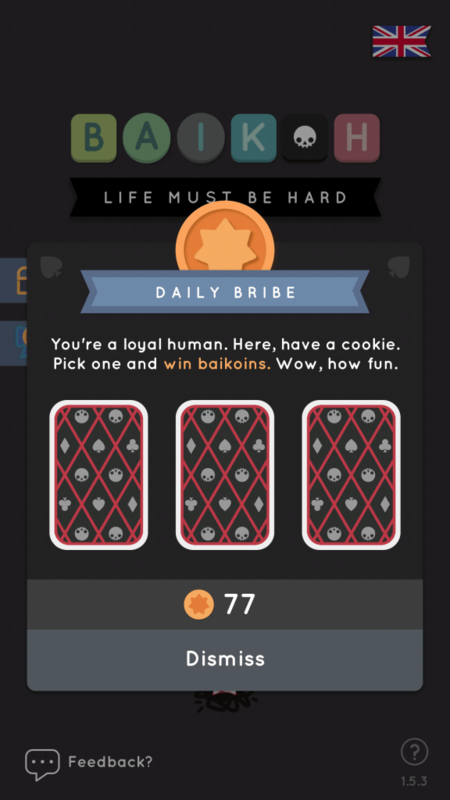 Play the “Daily Bribe” mini game to win coins. You will have to tap one of three face-down cards to get your reward. But wait! Don’t tap “Dismiss” yet. You still have a chance to reveal one of the remaining face-down cards. Just watch a video to get more Baikoins. Lastly, play the Solo game mode and get coins as rewards. On the “game over” screen, you will be given an opportunity to begin where you left from or get 50 percent of the rewards earned. You can opt for the former but you will have to watch a promo video. Doing this, your previous score will be intact and all tiles will be cleared. This way you can earn more coins. In the first game mode called Baikoh Says, you will have to follow AI’s instructions to spell words. These instructions range from typing a certain word to spelling words that start or end with a particular letter. You will have to find words before time is up. It is probably the toughest of all 5 challenges. The second challenge, called “Dictation”, seems pretty easy to play in the very early stages. You just have to spell words mentioned on the bottom of the screen. The game starts with 3-letter words, but becomes extremely challenging when the game board is crammed with more letters and you will have to type 5-letter words. Time keeps ticking away, so your goal is to score as many points as possible before the timer hits zero. In “Word List”, you will have to spell and send all words on a list before time runs out. You can catch a glimpse of this list by tapping and holding “Watch List”. One or more words will be hidden on the board, but not all words. Once you find a word in the list, quickly swipe to get a new game board, where you might find more words. In “No Repeat”, you will have to form as many words as possible before the timer reaches 0. But unlike the rules in the “Solo” game, you can’t repeat words and must type new words to stay in the game. In “Bombs”, you will have to diffuse as many bombs as possible. To do this, you must send words with bombs. So if the letter B is etched on a ticking explosive, you will have to form a word using “B” to deactivate the bomb. In all 5 challenges, if you get an “X” three times, you are out of a game. How to get the “you don’t say- write my name” achievement? “You don’t say” is the achievement and “write my name” is the hint. While playing a Solo game, you will have to write “BAIKOH” and swipe to send it. You will unlock the “You don’t say” achievement. What’s this icicle frozen tile? Doesn’t make sense to me. It freezes adjacent tiles. Use it as soon as possible to to avoid adjacent letter tiles from freezing. You will have to use a frozen tile twice to clear it. The frozen icicle tile usually activates when a normal tile falls on top of it.